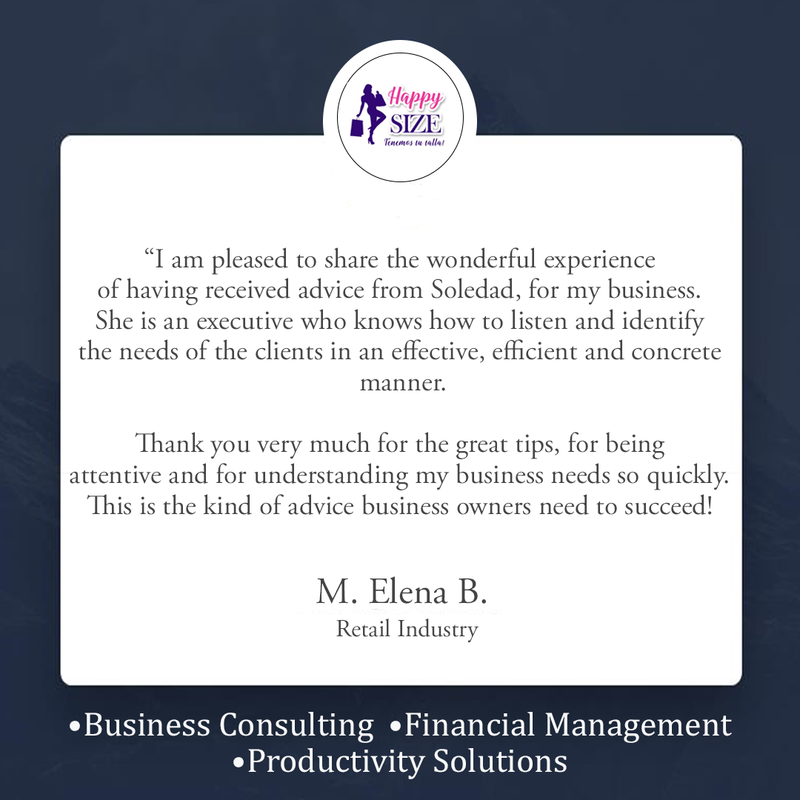 Assessment of your business for an improved 2019! <<First Name>>, is your company running at 100%? We conduct an analysis and create diagnostics to determine the main challenges for 2019 with easy to follow recommendations for improvements, to reach full potential and maximize profits. Don’t let this opportunity pass by! Prepare for greater success in 2019! 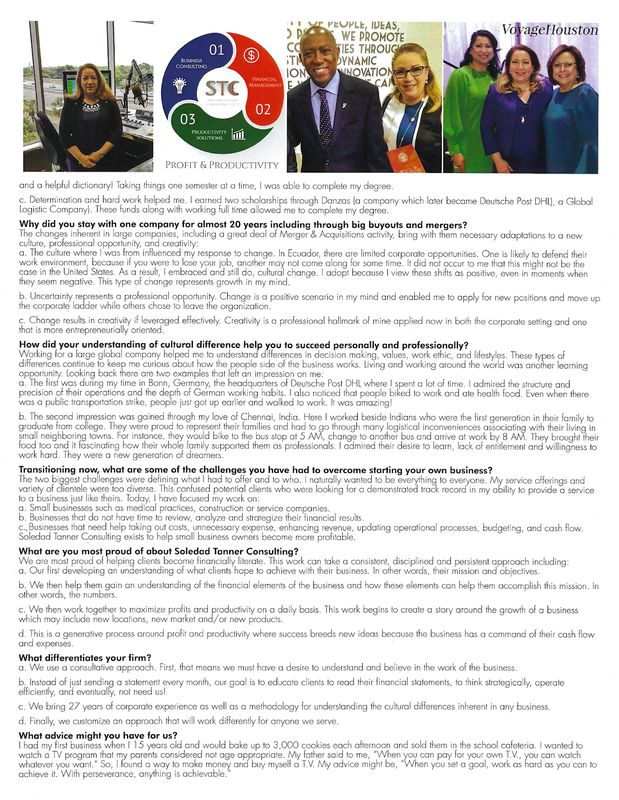 CLICK TO READ WHAT OUR CLIENTS ARE SAYING ABOUT US! An educational seminar hosted by Soledad Tanner Consulting LLC “The financial power in numbers: Discover what your numbers really mean” was a total success!! Would you like to develop your staff? 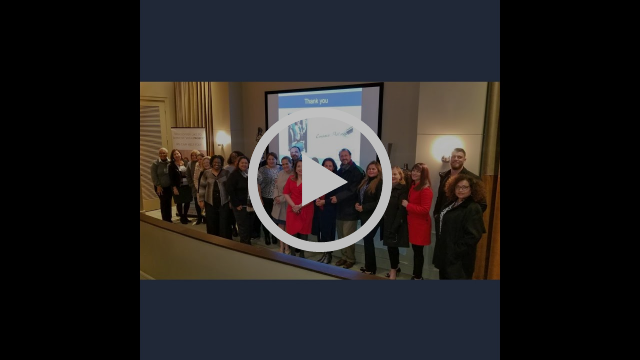 The first educational seminar hosted by Soledad Tanner Consulting LLC was “The financial Power in Numbers: Discover what your numbers really mean” was a total success!! We had a full house! Thanks to all who come to the event and made it a success. Soledad Tanner, MIB- Founder of Soledad Tanner Consulting, LLC spoke about how to understand the numbers that create success for your business, Shahara Wright – Commercial Lawyer and Founder of The CEO Effect, LLC, spoke about Contract for your business, Sofia Ivanka - Founder of Building Smart Kids spoke about Education as an investment. A huge thanks to all sponsors: Angelica Noyola CEO of Snapper Jack's Catering for providing the delicious food for the event (http://snapperjackscatering.com/), Rianne Rivadeneira CEO Rent-A-Spanish speaker for being our Master of Ceremony (https://riannerivadeneira.com/ ) and to Danelia Argueta – Marketing & Business Development Officer of Cy-Fair Federal Credit Union, for her “Random act of Kindness” rewards to our guests (https://www.cyfairfcu.org/). Save the date: Next seminar will be: Tuesday February 19 @ 6:30 pm. Stayed tuned for details on the next event in this series. 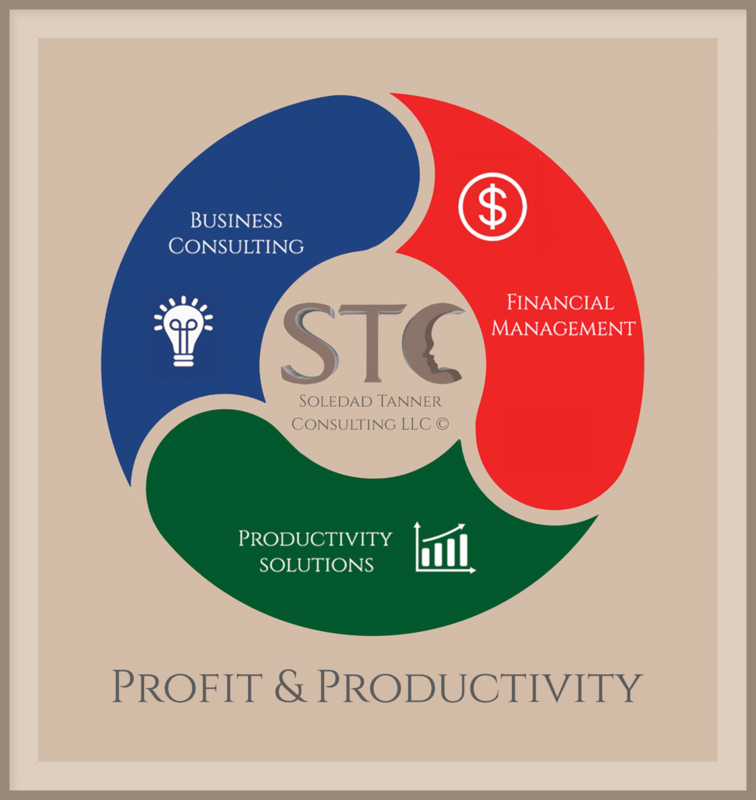 Reach out to me (832) 998-2136 for a complimentary consultation on how your business can be in the journey of improved profit & Productivity. 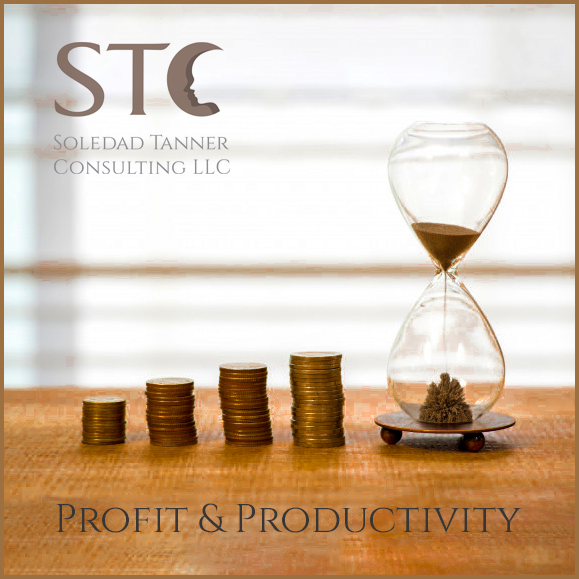 It's time to analyze the productivity of your business. Did your business have profit? Could you have made more? Did you spend too much? What else can you do to make the next year even more successful? Do you check your results every month? Do not wait to run out of working capital to figure out your finances. In 2018 we had a significant reform of the tax law. Not knowing about the changes can cost you thousands of dollars. Es tiempo de analizar la productividad de su negocio. ¿Tuvo su negocio utilidad? ¿Podría haber ganado mas? ¿Gasto demasiado? ¿Que mas puede hacer para que el año que viene sea aun mas exitoso? ¿Revisa todos los meses sus resultados? No espere quedarse sin capital de trabajo para darse cuenta de sus resultados. En el 2018 tuvimos una gran reforma de la ley de impuestos. El no saber de los cambios le puede costar miles de dólares. It has been well documented that immigrants contribute disproportionately to entrepreneurship. This is true both in the United States, where they represent 27.5% of all entrepreneurs but only 13% of the population, and in many other countries around the world. On average, immigrants contribute twice as much to U.S. entrepreneurship as native-born citizens do. But immigrants aren’t just creating more businesses; they’re creating more successful ones. A Harvard Business school study comparing immigrant-founded businesses to native-founded ones showed that immigrant-founded companies perform better in terms of employment growth over three- and six-year time horizons. The authors of the study, William R. Kerr and Sari Pekkala Kerr, conclude that immigrant-led companies grow at a faster rate and are more likely to survive long term than native-led companies are. Why is this the case? Researchers are not completely sure, but as William Kerr has said, “The very act of someone moving around the world, often leaving family behind, might select those who are very determined or more tolerant of business risk.” It’s important to highlight that not all immigrants or non-immigrants are the same, and there is obviously a tremendous amount of variability between individuals. However, many of the qualities that would seem to make immigrants more likely to succeed in building their own businesses are reasons you should consider hiring them to help build yours. Success in today’s business environment requires having a “growth mindset.” A person with a growth mindset believes their talents are not stagnant. They believe they can do more by working hard, coming up with good strategies, and taking input from others. Such people achieve more than individuals with a fixed mindset, who tend to think they were born only with certain innate talents, which are unlikely to change. A concept closely related to that of “growth mindset” is that of an “immigrant mindset.” People who are willing to uproot their lives in search of something better are the types of people who are determined to make change happen themselves. To migrate to a new country also takes a high level of confidence in one’s ability to change and a high level of tolerance for uncertainty. More importantly, they believe in their ability to figure things out and adapt once they get there. Being unafraid of new challenges and proactively reaching for them is extremely important for long-term business survival. Those companies that do not continually innovate and adapt along with advances in technology and changes in society eventually see their products or services fade in importance. Meanwhile, competitors, or simply new and better ways of working, replace them. 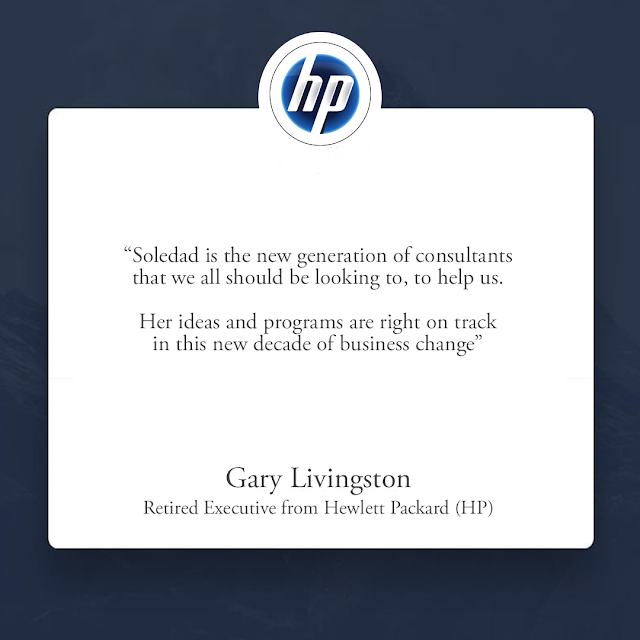 Growth demands that businesses view change as imperative, not optional. Immigrants, who are veterans of change, would appear to be likely to help businesses remain competitive and thrive. It requires adaptation skills to survive, let alone to thrive, in a new place. When you’re in a brand new culture, and especially if you’re learning a new language, the need for change isn’t a one-off, but rather a continual daily requirement. This is why even immigrants who might have come from wealthy or privileged backgrounds in their home country tend to quickly lose any sense of entitlement. Adapting can be a painful and difficult process, one that takes place on an ongoing basis. It forces a reexamination of the familiar and requires a person to make changes to how they think and act. Dharmesh Shah, founder and CTO at HubSpot and an immigrant to the United States, writes about many of the changes he made on an ongoing basis in order to fit in, from getting rid of his accent, to changing his appearance, and even temporarily changing his name to David. Here too, immigrants may offer a benefit for employers. Businesses are increasingly finding that rapid adaptation is necessary for success in today’s competitive environment. Hiring immigrants may help you build the organizational muscle of adaptability that will enable your company to be more receptive to, and act upon, the continual change that is required of businesses today. Immigrants usually improve a company’s ethnic and linguistic diversity, and they also bring a plethora of unique experiences, backgrounds, and knowledge to the workplace. And companies are paying attention to research finding that firms with more diverse people on staff have healthier financial performance, largely because non-homogenous teams tend to outperform teams with lots of similar people. But hiring a more diverse workforce is only half the equation. Without giving people equal chances to participate and truly integrating them into all aspects of the business, teams won’t reach a state of high performance very quickly, and the unique aspects of individuals won’t be leveraged to the highest degree. This is where inclusivity comes in. Immigrants know what it feels like to be an outsider. Throughout my career, I have noticed that the people on my teams who have either immigrated to a new country or spent extensive time living abroad are highly sensitized to the fact that others might not feel included. They tend to be more inclined to promote an inclusive way of working than employees without this experience. They are also more aware that others might contribute different experiences from their own. So, they tend to be more willing to hear voices that might otherwise go unheard in a business environment. Because they have experienced what it’s like to be different first-hand, they can also be more likely to be in tune with the realities of discrimination, both blatant and the more pervasive subtle kind. This, in turn, may make them eager to help prevent their colleagues from experiencing it. One of the most frequently overlooked benefits that immigrants bring to a business context is that they have international experience. Knowledge of other cultures and languages might not seem critical for a business that isn’t yet selling outside of its home country, but in order to keep growing, nearly every business hits a point at which they need to expand beyond borders. And today, with most businesses having an online presence, they are global from day one. Most companies are not prepared to handle global business from day one. They orient their firm around the needs of their home market alone. And when they do go global, it’s usually a painful process filled with plentiful organizational learning and growing pains. People who bring experience from a different country and cultural context may be more likely to prevent a company from having to deal with such pains, while accelerating the company’s organizational learning about how to become a global company. In my role at HubSpot, leading international expansion and strategy for the company, I’ve found that many of the employees who have immigration experience tend to think about potential international challenges much earlier. They’re not just thinking about the markets you’re in now and the customers have today. They have a more global outlook on life itself, and they bring this perspective to their daily work. They design processes and do their work in a way that prevents global friction later on as the business grows into new markets. 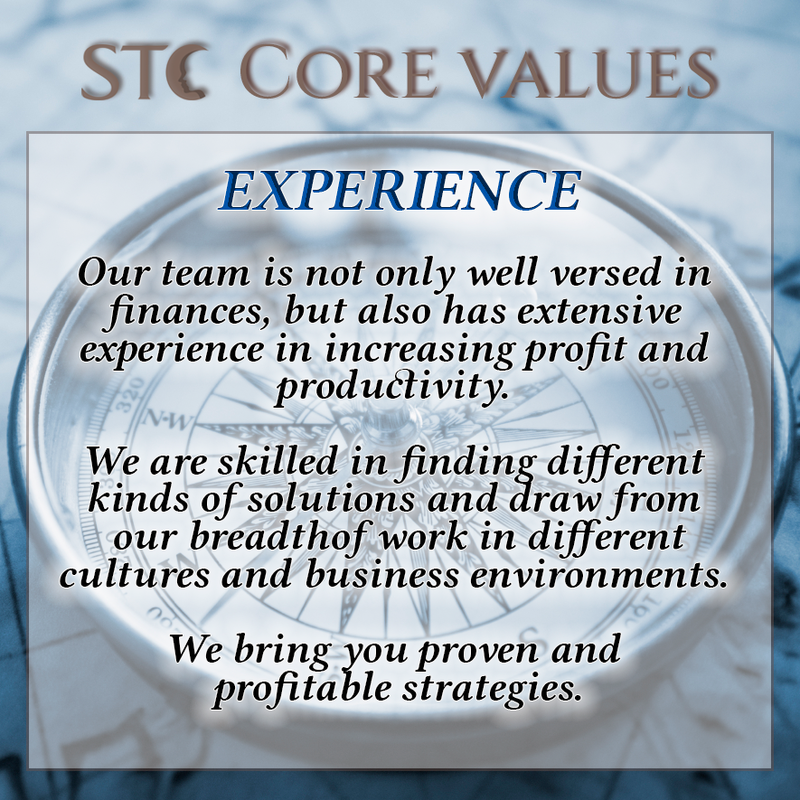 Invest in mobility and immigration expertise. Often, candidates who have immigrated might require additional support to ensure compliance with laws and regulations, especially where visas and work requirements are concerned. Make sure your legal team can support you with the ability to advise on the specifics in this area. Add international or cross-cultural experience to your recruiting priorities. Clearly explain your priorities to your recruiting team. They can help add international experience as a desired quality in job descriptions, screening tools, and so on. You can also tell them to look for people who were born in your home country, but spent a good part of their lives living abroad or have other cross-cultural experience. Flag people who know multiple languages. It’s not always easy to tell if someone came to your country from another just by looking at their resume, especially if they obtained higher education once they got here. Professional profiles, such as LinkedIn, enable you to filter by language to quickly find people with international experience. Also, consider adding language expertise to your existing systems, so that you can identify employees who might already have this without their managers being aware. Keep an eye out for candidates with an adaptive mindset. You don’t have to be an immigrant to demonstrate many of the qualities that make immigrants successful in business. Give consideration to employees who don’t shy away from change and have a track record of choosing the foreign over the familiar. Look for people who have made major career pivots, have overcome unusual or significant challenges, or otherwise show signs of willingness to explore uncharted territory while adapting and thriving in the process. 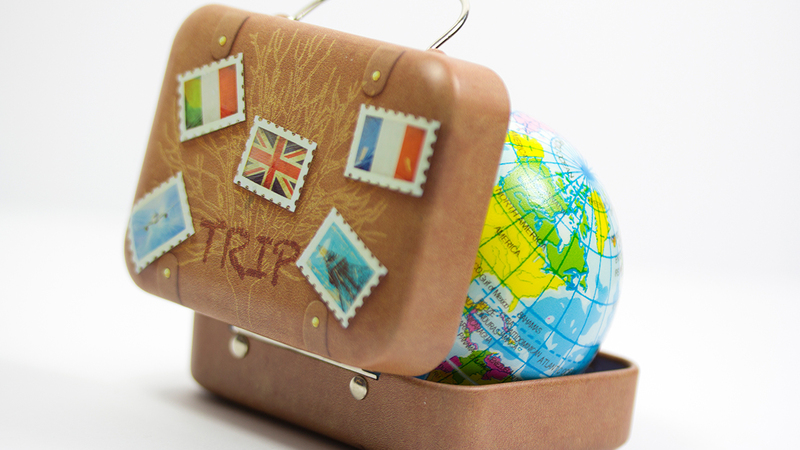 Encourage employees to obtain international experience. If you have offices outside your home country, consider creating incentives for employees to spend more time in those offices. The expenses can add up, but nothing replaces the value of living and working in another country, no matter how long, to help them contribute in a more meaningful way to your business, especially if international business is a key part of fueling your overall global growth. Don’t apologize when you succeed. Don’t complain or blame when you fail. You cannot change your situation until you own that you’ve contributed to your situation. When you take responsibility for what is happening in your life, you’re no longer the victim of circumstances. You no longer have to be a reactive object being acted upon by your environment. Instead, you can proactively act as an agent who impacts and changes your circumstances. You should only apologize if you’ve done something wrong. Apologies only make sense if you plan to never do something again. But you absolutely can and should own how you’ve been living and own what you’re learning. All the while, remain humble to the fact that “self-made” is an illusion. You have taken responsibility, and you will continue to take 100% responsibility. Yet, at the same time, you know you are nothing without the help and grace of others. Therefore, you remain deeply grateful and humble. This humility and gratitude is your strength. But it certainly doesn’t cause you to act smaller than you really are. That is a strange form of hypocrisy that is just as bad as pretending to be better than you really are. Don’t attach your identity to outcomes. Instead, attach your identity to your WHY, and to your behaviors — those things you can control. Principles govern outcomes. You govern your behaviors and you define your WHY. You start with Reasons, and from those Reasons you select specific Results you seek to achieve. From those results you develop Processes or Methods. The Methods are the means to the end and should never become the end in themselves. That’s the problem with modern psychology — the emphasis has shifted from people to process. Process matters, but only in the context of specific results you seek to achieve. You absolutely should seek outcomes. The more specific the outcomes you seek, the more clear will be your goals. Having clear and timely goals is essential to success. If someone tells you not to seek or focus on outcomes, they are lying to you. Said performance coach, Tim Grover, “When you crave the end result, the hard work becomes irrelevant.” The more clear and compelling the desired outcome, the more inspired, relevant, and bold must become your process. When you fail, don’t complain. There’s nothing good that will come out of it. When you complain or blame, you immediately shut yourself off to learning. You halt your own progress and will inevitably repeat the same blunder in the future. Failure is feedback. Failure is what neuroscientists call “prediction error,” which is essential to learning. You made a mistake. So learn from it. Be happy about it. You just stepped outside your small realm of understanding and now you have the opportunity to expand your worldview. If you allow this learning to sink-in, you’ll be empowered to create better outcomes in the future. If your behavior isn’t changing, then you’re not learning. True learning means you can produce a desired outcome. If you can’t consistently produce the outcome you want, then you haven’t learned. According to Brain-scan studies, if you do not address a problem in 0.25 seconds after a mistake is made, you probably won’t do anything about it. You’ll brush-off the mistake and continue forward in the same manner you’ve been going. You won’t be learning from your experience, and thus you’ll continue moving into your future by recreating your past. If instead, you would simply stop, address what just happened, and continue forward from a higher plane, you could then produce better outcomes in the future. You don’t have to live in your past. This can only happen when you truly own when you’ve made a mistake. Rather than complaining for failures — or blaming the bad weather or something else — you learn from what is happening and adapt. Charles Darwin has said, “It is not the strongest of the species that survives, nor the most intelligent that survives. It is the one that is most adaptable to change.” To adapt is to learn. The quicker you adapt, the better you’ll live. It doesn’t matter what happens to you, it matters how you respond. Without question, environment influence matters. But what matters more is what you do about it. You can either continue living reactively as an object, or you can adapt as an agent in new and better ways to change your environment. You can learn your lessons. You can succeed bigger than you can presently imagine. Success begets success. When you begin making huge leaps — you open yourself to different worlds of possibility. When you have momentum, confidence, and inspiration, you begin taking on bigger and more powerful goals. Don’ t apologize when you succeed. Don’t complain when you fail. Don’t attach your identity to outcomes. But without question, seek very specific outcomes. Set S.M.A.R.T. goals. Then get increasingly better at applying principles and honing your process so that you can consistently yield desired outcomes. “My purpose is to associate with and support strong women so we can all rise together and discover our highest selves and do the most good. I started my financial services business to empower the people around me and impact their lives, as well as serving my clients. My business is a vehicle for my truth about how education leads to knowledge and experience, which can open you up to lead a life of adventure and growth. Houston Guayaquil Sister City Association (HGSCA) y La Asociacion de Ecuatorianos en Houston reached out to the City of Houston - Office of Business Opportunities (OBO) to learn more about the City support and promotion of businesses in Houston. We are exploring opportunities to benefit Business to Business Connections between Houston and Ecuador. Soledad Tanner, Director of Business and Trade at HGSCA attended the meeting. 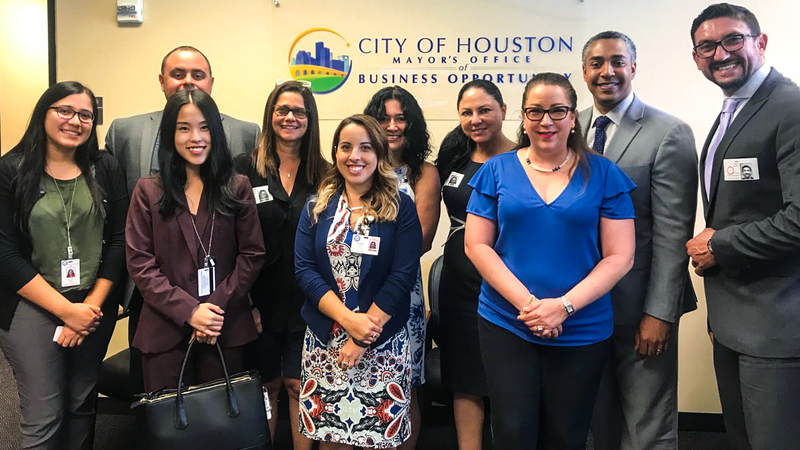 We are developing business relationships and investment collaborations between Houston and Ecuadorian business owners by taking advantage of the Sister City relationship. 𝗠𝗶𝗱-𝘆𝗲𝗮𝗿 𝗳𝗶𝗻𝗮𝗻𝗰𝗶𝗮𝗹 𝗿𝗲𝘃𝗶𝗲𝘄: Take a pulse of your company, compare where you thought you were going to be vs. were you are and analyze the variances. 𝗬𝗼𝘂 𝘄𝗶𝗹𝗹 𝗱𝗶𝘀𝗰𝗼𝘃𝗲𝗿 𝗼𝗽𝗽𝗼𝗿𝘁𝘂𝗻𝗶𝘁𝗶𝗲𝘀 𝗼𝗳 𝗶𝗺𝗽𝗿𝗼𝘃𝗲𝗺𝗲𝗻𝘁𝘀 and will identify changes you need to make to have a very successful year. We are officially mid-way through 2014. True, this isn’t a newsflash. But did you know this a perfect time to do a financial review? I know, I know, your mind is set on relaxing and having “hot fun in the summertime!” Who wants to (strategically) think about their money right now? Yet, this half-way point represents a perfect time to do a review of your money and money-based goals. The slower pace is an invitation to pause, evaluate, reflect and perhaps press “reset.” Something you’re likely doing professionally, anyway. 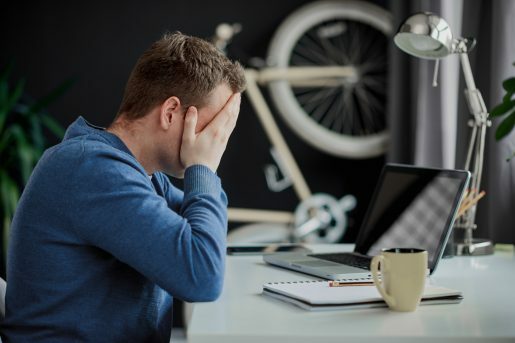 Even if you’re not steeped in a traditional “corporate” work environment, you might be engaged in a mid-year performance review process of some sort. So, why not do the same when it comes to your finances? Why not take a pulse check and compare where you are vs. where you thought you’d be by now – six months into the year? This makes July the perfect time to apply the concept and exercise of a mid-year workplace performance review to your finances. 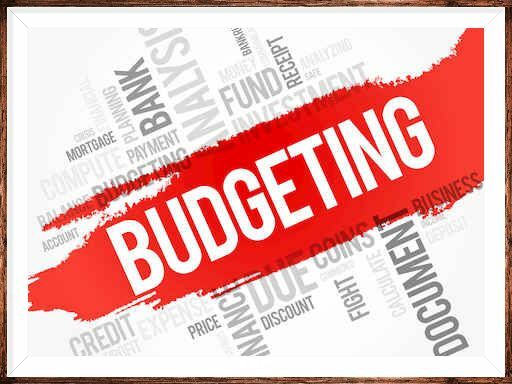 A financial review allows you to identify opportunities you may have overlooked up to this point and/or to identify tweaks that will enable you to course-correct for the six months ahead. also potentially set you up to experience (even more) financial success and finish the year strong. Pull your banking, investment and credit card statements – what are your current balances? What habits are you practicing daily, weekly, monthly? How do you feel – excited, energized, lethargic, dismayed, or something else? What goals did you set at the beginning of the year? What habits did you commit to changing or developing? How do these measure up to where you are now? Are you on/off track? What mistakes (in action or judgment) did you make? How proud do you feel about the progress you’ve made? How disappointed do you feel about where you’ve fallen short? As a result of the two phases above, do you need to change any goals or any of the parameters you’ve established for achieving them – in other words, is a “reset” in order? What new goals or habits would you add to your plate for the next six months? If distractions and unexpected commitments threw you off-course, what do you intend to do to minimize how these may negatively impact you moving forward? What would make you feel most satisfied when 12/31 arrives? 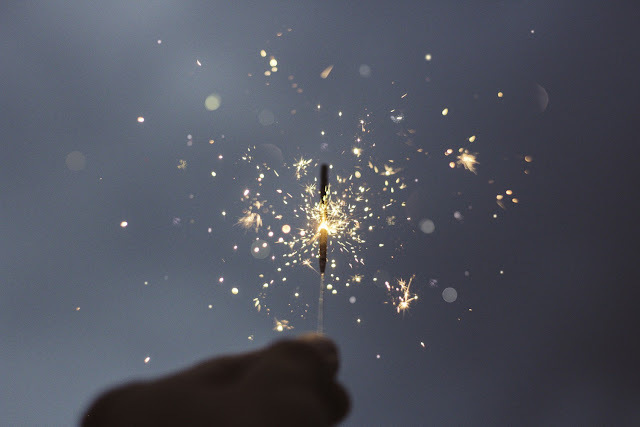 Performing a financial review is not only helpful for confirming what has happened and shedding light as to why your results are what they are, but it can also serve as a preview for what’s to come. This exercise can help you objectively assess and adjust the choices you’re making and provide insight as to the ones you’d benefit from making. Additionally, it can highlight if the systems, processes and framework you have in place are as supportive of your efforts as you think they are and need them to be. Are you dreading doing this financial review because it’s summer; because you don’t want to face what you’ll discover; or both? Well, remember this: it’s perfectly fine for you to be in vacation mode…your money, not so much! Your money should be working for you 24/7/365. Second, if you’re concerned about how long this will take, then break it down – carve out three (3) 30-minute windows – maybe during lunch – to address each phase noted above. Finally, focus on the power you’ll gain from the insight you’ll discover as a result of having a meaningful conversation “with” your money. Need another incentive to perform a mid-year financial review? Just like any other relationship, your money won’t grow as much as it could without your purposeful attention, direction, and action. 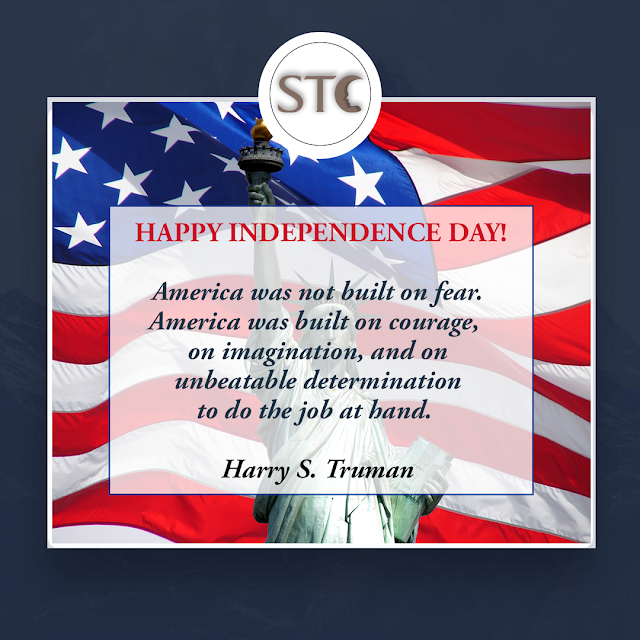 "Make this Fourth of July memorable by counting your blessings and truly appreciating your freedom. 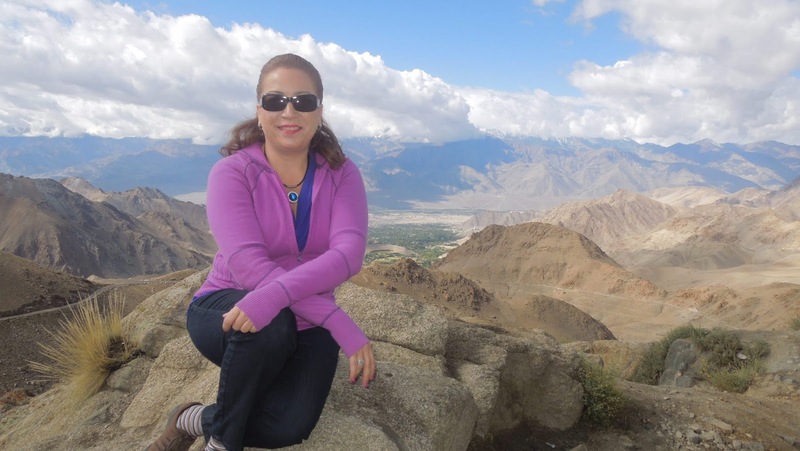 Author unknow"
I grew up in Ecuador in a time when gender differences between men and women were very pronounced. Since childhood, I have seen that men and women were treated differently and acted differently and that women tended to stay quiet to be considered “nice girls.” In other words, for a woman to be outspoken, she wouldn’t be a “nice girl,” but I knew that was no way to live. During high school I was on a pre-medicine track, but when it came to applying for college, I decided to switch to business and engineering. All the applicants for each major had to take one introductory 3 months course, and only the top scoring students got to continue studying on that track. Without having taken the preparatory classes, I was starting out at a disadvantage. But, out of 1,200 applicants, I was one of only 120 who made the cut. That was only the first part of the battle. Then, I had to figure out how to pay for university, because they are private in Ecuador, and there was no financial aid. I didn’t have a job, so I had to find one. Over there, most of the jobs were gotten by word-of-mouth. My mother is from Ecuador, but my father was Ecuadorian with Swiss roots, and we would attend events at the Swiss Consulate. I was at an event there, and I gathered the courage to ask the Consul General for a job. I was only 17 years old. It paid off, and I got my first job as the Assistant to the Swiss consulate. I was a full-time student, employee, and party girl. By my third year of college, I was the Operation Manager of a Financial Institution and a model college student. But, my life was turned upside down. My father died. I lost the person whose opinion I valued most. At that time, my older brother was already in Switzerland and my younger brother was finishing high school. I was the only person in my family that was working. My salary was good for a single student living at home, but it wasn’t enough for a breadwinner in a family. I once again found my voice and spoke with the President of the Financial Institution and applied for a Treasury Manager job with them. I offered to do both jobs for half the value of the second position, which meant I would do double the work for 3/4 what it should cost them. This boost of income gave my family time to find jobs to support themselves. I also learned a powerful lesson about paying it forward. I went to one of my previous managers and asked for a job for my brother, and the manager said, “I don’t have a job for your brother, but I have something better.” He told me that he was a young boy living in Argentina when his father died, and his father’s boss saw the hardship that fell onto the family and paid for his college education. “I tried to pay him back later, but he told me to pay it forward and help someone else instead. I have been waiting my whole life for that person to come along, and here you are.” He paid a full year of tuition for my brother to attend college, which was a big relief to my family because he wouldn’t have to delay his education as we sorted out our finances. That generosity was especially well-timed because my faith in humanity was being tested when I had to go to the banks and take care of the legal aspects of my father’s death. I was only 20 years old and having to talk to lawyers and deal with contracts my father had signed, and the only way they could hear me was for me to speak in equal terms. I wanted to leave my father’s name clean, so I found the fire within me to stand up for him and protect the estate. Since then, I respectfully, eloquently speak my mind. My university classmates saw my struggle and collected 100 signatures in a petition to the Dean asking for a scholarship for me. The university didn’t give scholarships, so this would be the first one, ever. They granted me one, but it wasn’t charity. It was because of my good grades, that my father was an alumnus of the school, and that they didn’t want my hardships to stop me from my path, which was heading toward success. As a way of saying thanks, we donated all my father’s professional books to the university’s library. After I finished my engineering/business degree, I wanted a new life and the opportunity to further my education. Such a life awaited me in the USA. I thought, “This is my life, and I’m going to do what makes me happy because when you just do what makes other people happy, you’re not fulfilled. Happiness is a decision I make.” This mindset helps me see clearly what’s important and not important. This is my powerful soul engine. I grew into a determined, powerful woman. If you really want to do something, you have to put your voice to your dream. I arrived in Houston with very little idea of how the university system works here. I had thought you just paid for and attended university, so I was disappointed to find out that there was an application process, and I didn’t have any letters of recommendation. I took a day and looked at all the universities in Houston, and I really liked St. Thomas. So, I went to the admissions office. It was July, and I wanted to start in August. I gathered my courage and asked the receptionist, “Where do I register?” I was told to apply and wait a semester, and I said, “I want to start now.” “That’s not how it works. You have to have GMAT and TOEFL scores.” I persisted, and finally, she realized I wasn’t going to leave. So, she told me to fill out the form, and if someone dropped out of admissions, she would submit my request to the board. A spot opened up, so they gave me conditional admittance and three months to finish those admissions tests. I had studied the English language, but never studied other subjects in English, so I began by taking only one class the first semester. I had to read with the dictionary beside me and learned the credit hours and grading system because I didn’t know what a GPA was at first. I had also never seen multiple choice exams and didn’t know how to take them at first. But, I kept learning, and after four years, I graduated with my MBA in International Business. Life is a set of miracles that happen if you continue to walk in the direction of your higher self. You’ve got to have faith and know that a miracle would happen somehow. We are all angels for each other at different times. I love people who come into my life and listen to them with sensitivity because I know that at any time I would need to be that angel for someone, like all the people who helped me in my times of need. Nowhere did I see this more clearly than on one of my jobs with DHL that took me to India. That place overpowered my senses. It’s the opposite side of the planet from Ecuador, but it was also upside down from the culture I had known. That attracted me because I saw that there were other paradigms for living a balanced, happy life. I saw new avenues for thinking and experiencing, and I got to explore them. For instance, eating with your hands. I wouldn’t have ever thought to eat without a fork. I felt very developed because the French invented the fork and knife, but the Indians say, “Poor Westerners, who have lost the 6th sense of feeling the food.” It’s a more complete experience of eating. The religious diversity and tolerance were also eye-opening. There were Muslims, Buddhists, Hindu, Sikhs, and Christians living in harmony and respecting each other’s sacred spaces and practices. I had the privilege to go into Mosques, the Golden Temple of the Sikhs, and Hindu temples. All the spaces were beautiful, energetic, and respectful. I was off-put by the Hindu animal gods at first, but I saw the faith and devotion of the people, so I investigated. I now see the goodness in each of the religions. I also got to see the ceremonies of the Himalayan Ganges River in Varanasi, the oldest city in India, and the experience was incredible. There’s a ritual that celebrates the female energy and respects the Ganges river for nourishing the area and supporting the crops. This ceremony includes cremation of those who died, and then the ashes are sprinkled in the Ganges to return their souls to the mother source and be carried into the next life. When I went to Varanasi, I took a boat tour on the Ganges and found peace with my father’s death. I participated in another ritual they have for souls whose ashes are not there to be put into the river. They place a flower boat with an offering into the Ganges for those other departed souls, and I performed this ritual for my father. This opened a big window inside my heart, and I try to look at the soul of each person that I meet, not just their human shells. When I speak, I choose words from my heart and trust my voice, because my voice is divine self-expression born from the love I felt when I brought my father’s soul to the restorative power of the Ganges River. And now, as an entrepreneur, I started my financial services business because I know and that others need my knowledge and experience. It’s also important to me to empower the people around me and impact their lives, as well as serving my clients. My business is a vehicle for my truth about how education leads to knowledge and experience, which can open you up to lead a life of adventure and growth. Particularly, for me, this is about the financial sector and how when we’re educated about how our money works, we can make better business decisions about how to grow it. With a strong voice, I demand respect, and I use that power to pay it forward and help others who have big dreams and need angels to help them pave the way. I speak with gravity in my voice, so that I am heard. I have found my voice through knowledge and experience, which are the foundations of my confidence. As I exercise my ability to speak my truth, I get more comfortable to do it and not stay quiet when I know something is wrong, or I have help that someone needs—for me, this is primarily in terms of business and finance. No one’s going to suddenly knock on my door and tell me I have the right to speak. I speak from my soul, and I give myself that permission. My purpose is to associate with and support strong women so we can all rise together and discover our highest selves and do the most good. 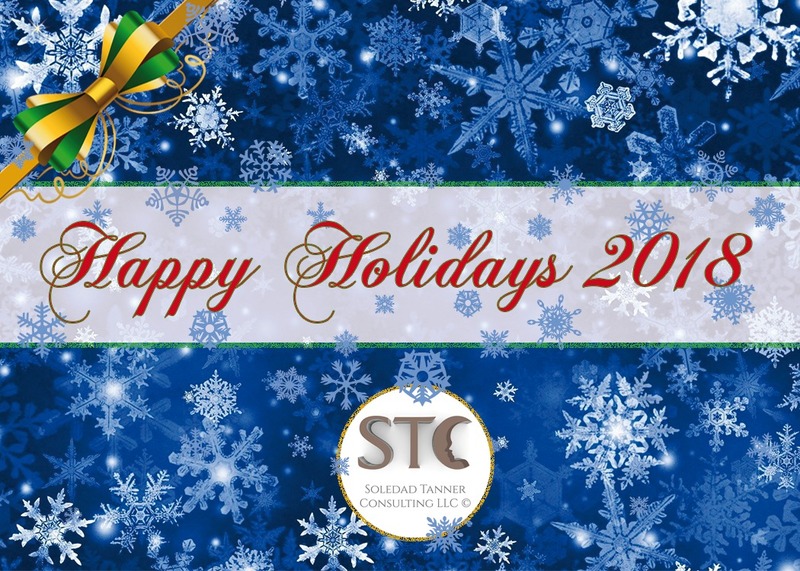 Tanner was a rising star with Danzas and DHL Global Forwarding, beginning as a Controller Houston and SouthWest USA. The company valued her strength as an efficient leader, in conjunction with her excellent people skills and promoted her Controller of Industrial Projects and later Controller of Sales; both positions put her in leadership across the entire USA. 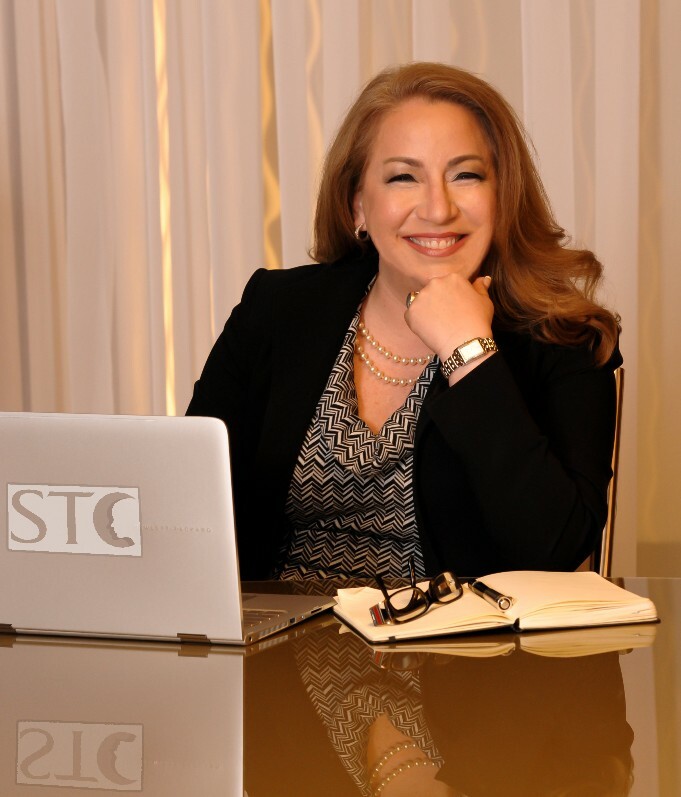 She is now the founder and CEO of Soledad Tanner Consulting, a Houston based consulting firm that seeks to improve the profit and productivity of businesses by supporting clients with knowledge and expertise so they stay competitive in the market.